Pre-owned SUVs Oakville – Budds’ BMW Oakville. 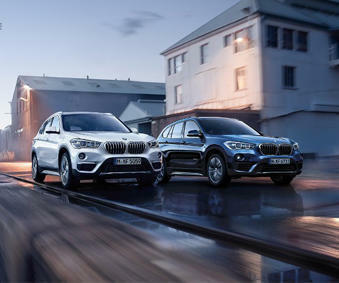 If you are living in the Oakville area and you are interested in SUVs and the benefits they can provide, you should come into Budds’ BMW Oakville today or check out our inventory online. We have a huge inventory of new and pre-owned SUVs Oakville that you can choose from, and all of our SUVs are constructed with high quality materials and innovative technology. SUVs are built to provide safety, cargo room, towing, and comfort for the driver and their family, so you can trust that Budds’ BMW Oakville has got your best interest in mind with our selection of premium pre-owned SUVs Oakville. We have made it very easy for you to search for pre-owned SUVs Oakville with our online website. When you reach our online inventory, you will be met with a plethora of information about new and used vehicles, along with plenty of information regarding other aspects of Budds’ BMW like parts, maintenance, media, and some history. Once you have reached our pre-owned vehicle page, you will have the freedom to filter your search so that only SUVs show up, and you can narrow your search down more effectively. There are plenty of other filter options you can choose from when you are looking for pre-owned SUVs Oakville on our website as well. You should have no problem finding the pre-owned SUV that you are looking for. SUVs are typically built higher off the ground giving the driver more clearance to drive over bumpy dirt roads, or roads with obstacles. All wheel drive allows power from the engine to be distributed evenly to all four wheels allowing for a more safe and stable feel when driving on roads in bad weather or on roads that are bumpy or rocky. Both new and pre-owned SUVs Oakville are built with more ride height, meaning you sit higher off the road and have a better view of things around you. The cab of SUVs is built to add more headspace and provide a spacious yet comfortable feeling when inside the vehicle. Also, having the added height on the vehicles provides safety. SUVs provide customers with ample cargo room to go along with the passenger room. You can transport your family and get groceries, or store luggage comfortably. New and pre-owned SUVs Oakville provide convenience for families. There are many more benefits that come with driving an SUV, and if you already drive one, then you know what benefits mean the most to you. If you are an Oakville resident and you are looking for pre-owned SUVs Oakville, we recommend that you come into Budds’ BMW Oakville or go to our website online. Either way, you will be able to find the SUV that suits your needs and your budget, and our representatives are here to assist you in the process. If you have any questions regarding pre-owned SUVs Oakville, please contact us via phone or email.